Functional Emergency Medicine Approach: is there a compromise to airway, breathing or circulation and a possible allergen exposure? If so, it’s likely anaphylaxis. Edema of the anterior tongue, base of the tongue, or larynx significantly increases the likelihood of intubation or surgical airway management. Early administration of epinephrine (adrenaline) is the most important intervention in anaphylaxis. It is life-saving and intubation-sparing. Rapid recognition is critical. If the patient has compromise to airway, breathing or circulation in the setting of an allergen exposure, anaphylaxis is extremely likely. 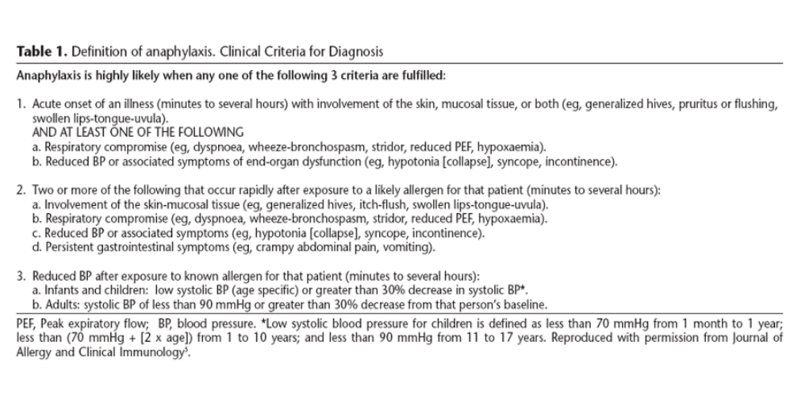 The most important step in management of anaphylaxis is early administration of epinephrine. Epinephrine is life-saving. Davis JE, Norris RL. Chapter 19: The Crashing Anaphylaxis Patient. Emergency Department Resuscitation of the Critically Ill. 2011, ACEP, Dallas, TX. 177-185.